I hope you found a nice bicycle helmet and arrived well in Unterschleissheim. The helmets, I have to admit, are a tribute to the sports industry which makes easy profit from selling them to the fearsome people. And they are a tribute to the insurrance companies, which can refuse to pay you a compensation, in case you are hit by a car and did not wear a helmet. Aestetically, however, they are a disaster. People look like a Alien III monster when they wear a bicycle helmet. 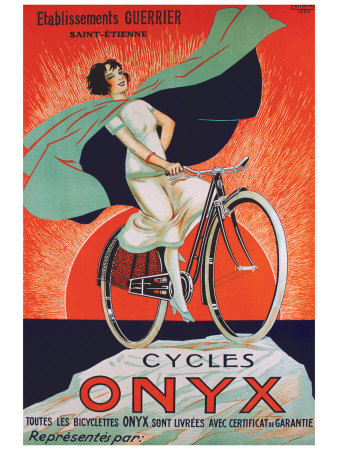 When you were sitting on the bike yesterday, with your open hair and the trenchcoat, you reminded me of a picture I saw on an french retro-poster advertising bikes (see below). I think we should make a photo of you on the bike, without a helmet. Have a nice evening, see you tomorrow.